There are very real policy challenges facing international education and they have grown steadily over the past few years. NAFSA’s role as the leading voice in connecting people and changing the world has never been more critical. Continuing proposed policy changes represent serious threats to our work ensuring the United States remains a welcoming nation - to immigrants, Dreamers, refugees, and international students and scholars. The ability of the United States to remain globally engaged is also at risk. Our association continues to advocate for a welcoming world based on acceptance of all and the freedom to move easily across national borders for study, work, travel, scholarship and volunteerism. We need your support to continue and grow our efforts. 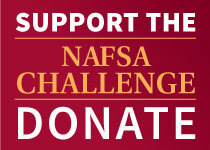 Please consider a generous donation to the NAFSA Challenge. NAFSA launched a campaign to further educate policy makers about the immense benefits of international students and scholars and how they create jobs, drive innovation, enrich our classrooms, and strengthen our national security. NAFSA’s Government Connection program provides updates on the most pressing regulatory issues affecting your work. NAFSA continues to build support for the Paul Simon Study Abroad Act which vigorously promotes study abroad opportunities. We will keep pushing for its passage until all students, regardless of their backgrounds, are able to thrive in a globally connected society. NAFSA partnered again with Welcoming America in its annual Welcoming Week campaign where campuses hosted events that reinforce higher education's commitment to creating welcoming campuses and communities. NAFSA made sure your voice was heard by agency officials through our liaison program and our monitoring of regulatory actions. Our online resources at www.nafsa.org/reginfo continue to be an important resource for the field. NAFSA provides an advocacy website, Connecting Our World, to provide updates on pending legislation. We sent urgent action requests throughout the year, which you and other advocates responded to eagerly and often. NAFSA continues to champion full access to Cuba, refugee protection, and other legislation and policies that would improve our immigration system and remove obstacles to studying, living, and working in the United States. NAFSA’s annual release of our International Student Economic Value Tool continues to be the standard for measuring the staggering impact that the $39 billion and more than 455,000 jobs have on the U.S. economy and U.S. higher education. NAFSA’s successes are the result of the work you and your colleagues do every day in your communities to make your voices heard. It is also because of persistent push-back by NAFSA on any and all policies and legislative proposals that threaten the continued and vigorous growth of international education. We need your financial support to make our work bolder and even more effective and impactful. Please consider supporting the NAFSA Challenge during these most important of times.